With all the gains you've made in reading this year, a powerful summer reading program can help maintain and even grow students' skills until you see them again in the fall. This could be something simple with a small prize for those who read a particular number of books over the break. Or, your program can be much grander with many facets including letters and publicity to parents, recommended reading lists, motivating incentives, a tracking process, etc. As with everything, the hardest part is time and money; we're short on both these days. Maybe we can save you some time by providing an outstanding program that Cheryl Verkamp, 6th grade teacher at Cedar Crest Intermediate School (Huntingburg, IN) developed and had great success with last summer. The premise behind Cheryl's school program was a BINGO game. Each student was provided a BINGO sheet with specific reading activities listed. (Click here for another BINGO sheet option.) The examples listed are geared toward upper elementary grade levels, but each could be easily exchanged for more K-2 appropriate activities using the BINGO Template in Word. 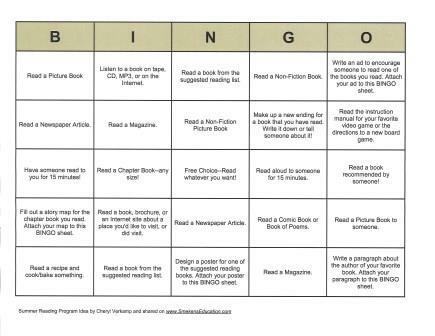 The BINGO sheet identifies the list of reading required. Rather than assigning the traditional "read eight books over the summer," students were to read a magazine article, read a picture book to someone else, listen to an audio book, read a recipe, etc. This is real-world reading! Cheryl said the students loved the variety. Knowing not everyone reads the same types of things, she wanted to entice all her students to try this reading program. She was especially amazed at how it hooked her male students. 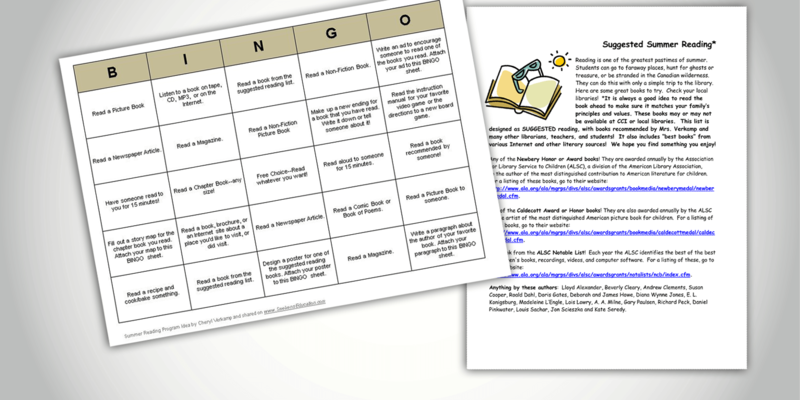 Besides just listing the reading tasks, the BINGO sheet also serves as the tracking process. She explains in her student/parent letter that as students complete an activity, they have to cross it off. For every 5-square BINGO they complete, they earn a ticket for small prize drawings. (With opportunities to win five tickets for the horizontal rows and five tickets for the vertical rows and two more tickets for the diagonal squares, a student could earn 12 tickets total. That's up to 12 chances per student entered into the drawing for individual prizes.) This is a great way to honor the individual students who participate in the summer reading program. But getting a handful of students to read over the summer was not Cheryl's goal. She was going for school-wide participation. So she upped the challenge to a BINGO Coverall--completing every task on the BINGO sheet. Of course, to woo students to do the reading, there needs to be a major incentive. For the students at Cedar Crest, the award was a movie/game party for the class that returned the most Coveralls in the fall. Cheryl reported that competition at that level was motivating. And with the reading activities so short and high-interest, students didn't see it as too difficult. Cheryl said the percentage of participation was the best they'd ever had in any summer reading program and she's eager to do it again this summer.